This week, I knew I would be seeing the biggest challenge to my training yet: training while traveling. I have one of those jobs that requires me to travel frequently during the week and this week’s business took me to Columbus, Ohio. My planned trip would include a day of traveling on Tuesday, all-day on Wednesday, and traveling home Thursday after meetings. I knew this week would require some careful planning to be successful. Used my Charity Miles app to raise some lumber for Habitat for Humanity. 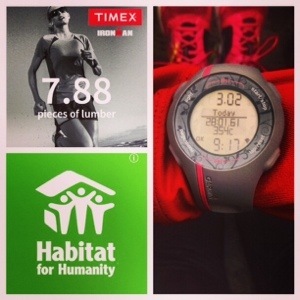 Thanks for sponsoring me, Timex! Monday: 3 miles at a 9:17 pace. My legs were still incredibly sore after a 19-mile weekend on the treadmill when polar vortex temperatures forced me back inside. I really hate the treadmill. It’s great in a pinch or when you have no other option, but in my opinion, it should not be an option while marathon-training because your strides are shorter when you run for hours on a moving belt than if you run for hours using your own momentum to push you along. This realization was quite apparent when yet again my legs felt dead and heavy on my run. The wind was still very strong and bitterly cold (I admit that I was running angry into a 20 mph headwind that felt like my face was being torn off in my last mile of this run), but I couldn’t stand getting on the treadmill again. It’s really been an awful winter, hasn’t it? Tuesday: Rest. I had a scheduled 7-miler planned, but I opted out of waking up early to run it because I was up late packing and working on last minute preparations for my work travel. I decided that I would go for a run when I got to the hotel after 7PM EST that night. Unfortunately, that plan didn’t work. I was traveling with my boss who insisted we go to dinner to talk about the next couple of days. Fair enough. It is a work trip after all. But running after a big dinner sounded like the worst idea ever and I opted for wine instead. 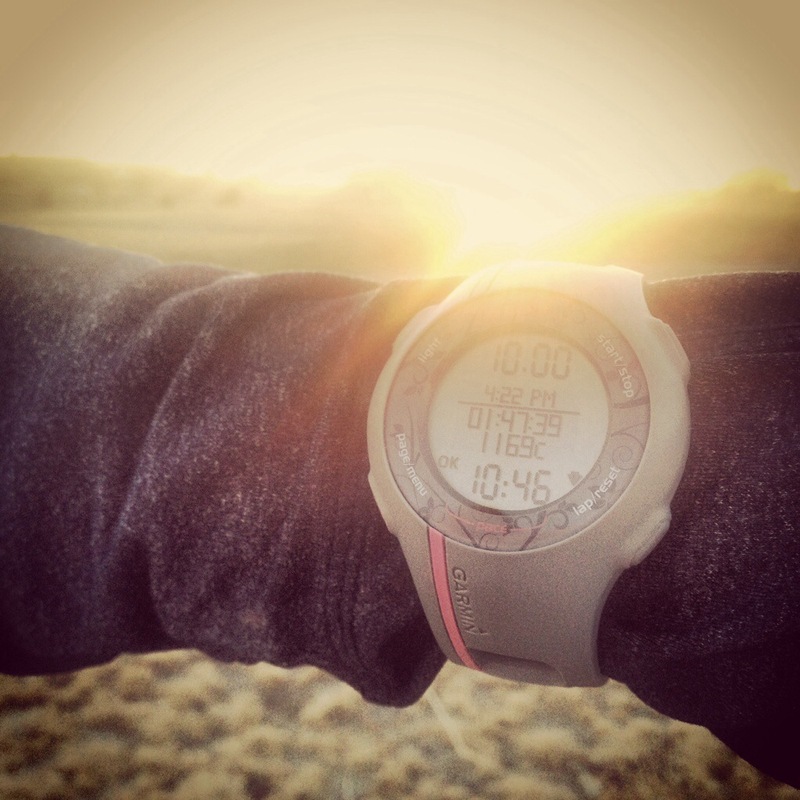 I decided that I would wake up the next morning and run. 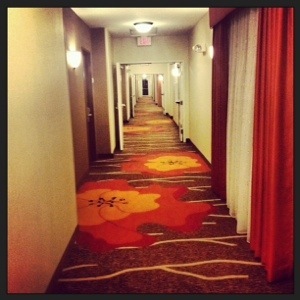 These hallways are perfect for speed work, and I almost ran them when the hotel’s only two treadmills were taken up! Wednesday: 2 miles at a 9:15 pace. Here’s what surprised me about Wednesday’s run: I actually woke up before 6AM when the gym opened to run it. I am absolutely NOT a morning runner (though I do enjoy it sometimes, but I’m at my best when I run at night). Here’s what also surprised me about Wednesday’s run: the hotel lied on its welcome brochure because there were already people midway through their morning walks on the only two treadmills available. The gym must have opened at 5AM. That was insanely frustrating. I only had time for a 3-mile run before I had to change for my day of meetings and meet my boss at 7AM for breakfast. And the people on the treadmill were WALKING, not running. Nothing against walkers– but you can walk in the halls, and the particular wing where the fitness center was located had no guest rooms– only empty banquet rooms. It was long and perfect for speed work, which I was THIS CLOSE to setting my stuff down and running from end to end until I had to go back upstairs at 6:30, but then one of the walkers got off the treadmill and I stepped on. And let me tell you, it was actually a pretty miserable run. I was horribly dehydrated (probably from air travel and the previous night’s salty seafood) and my nose was stuffy (probably from the hotel’s heater– I couldn’t breathe well the entire trip) and all I could think about was “I’m going to be late, I’m going to be late.” All I could run was 2 miles before I had to leap off, stretch quickly, and run upstairs. I vowed to try for 5 miles after my meetings and before dinner, but the problem with traveling with someone is that you don’t have full control of your schedule. I only had about an hour after we got back from our day of meetings and traveling for four hours across rural Ohio before I had to meet my boss again, and I spent this hour catching up on work emails that had come in while I was out of the office. And after another dinner and glass of wine and shoptalk, I had to settle for the 2 solitary miles I squeaked in for the day. I took it all as a learning experience. 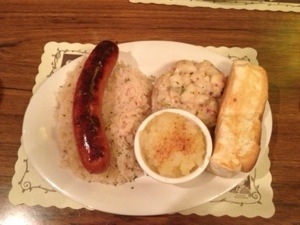 Dinner at Schmidt’s Sausage Haus in the German Village of Columbus, Ohio. This is their “Bahama Mama” sausage and it was awwwwesome. Protein, right?? 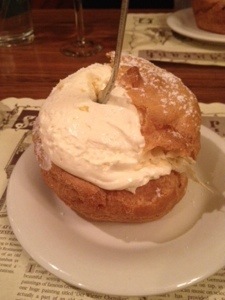 Okay, running is for cream puffs, am I right?? Thursday: Rest. Thursday morning, I intended to get up and try to get in a run again, but the meeting I had scheduled for the day was going to be a 5-6 hour meeting and I needed to feel fully prepared for it. Waking up at 5AM when I was up until 11PM working and getting through a 5-6 hour meeting was likely not an option. My meeting did, however, end early and I had about 3 hours before my flight home. If I was alone, I probably would have found a park to go for a light easy run, but my boss wanted to debrief after the day over more Schmidts sausages in the German Village of Columbus. No argument there! Friday: Rest. Thank God I was home, though I didn’t get through my door until around midnight. I intended to run a long-miler on Friday evening to make up for some lost mileage, but I’d brought my mom some fudge from Schmidt’s Fudge Haus where my boss and I went the night before after dinner at Schmidt’s Sausage Haus and the weather was likely going to be dangerous Friday night. I decided to just take another rest day. No, not the best idea, but I own that decision and I’ll take the consequences for it. Not usually a time that I am okay with,but using Hanson’s Marathon Method and taking an easy pace will hopefully get me where I want to go. Saturday: 10 miles at an easy 10:46 pace. I say “easy” because I recently decided (and probably not the best decision to switch in the middle of training) to another training plan, the Hanson’s Marathon Method. Not that I think my experiences with Hal Higdon’s training plans have been awful, but I think I legitimately need coaching as far as how I approach each run. I have a tendency to go gung-ho, all-out, guts on the floor, see what I’m made of with each of my runs and then I go through the cycle of feeling disappointed when I am too exhausted to meet my pace goals and that can be demoralizing. Hanson’s Marathon Method, for those who are unfamiliar with it, sets pace requirements for each type of run you do– long, easy, tempo, speed work, and strength. I feel like having that kind of direction will not only help me get to my 4:00 marathon in Minneapolis (even a 4:15 marathon would send me over the moon) but will also help me mentally tackle every run in a more healthy and positive manner. And this run was spectacular. Going at a pleasant but challenging easy pace for almost 2 hours on a sunny, warm-ish late winter day and not feeling like a failure for not running the pace times I feel like I “should” be running felt like such a burden off of my shoulders. For the first time in a long while, I actually really enjoyed a long run. Sunday: 8 miles at an easy 10:31 pace. I wish I could say the same about Sunday’s run as I did about Saturday’s run. Sunday, I don’t know what was going on in my head, but I was flat-out completely unmotivated to go for a run. I just…..couldn’t make myself care enough, even if “all” I had to do was run 8 easy miles. I put it off all day– literally– and wasted a great weather day by finally pulling myself off the couch and going to the gym at 7:30 and running until 9PM when the gym at my apartment closed. I was midway through a cool down after slogging through admittedly with a really terrible attitude (what was my problem!?!?!) when the cleaning staff came upstairs and told me to get off the treadmill. I wasn’t even proud that I got my run in because frankly, I didn’t get my run in. Or at least it didn’t feel like I did. Every second of it, I wanted to be done. And I opted for the treadmill on a gloriously warm day when just the weekend before, temps were literally 80 degrees colder. It was not a proud run. Sure, I got it done, but I didn’t give myself credit for it. All in all, I ended the week with 23 miles or 7 fewer than the week before. I learned that keeping a training schedule while traveling was all going to depend on me having the willpower to just go get it done when I had the time to do it and not wait for the next best time I could get it done. I also learned that it would probably take a little strategy, too; meaning, I’d have to make sure that I schedule my short runs and rest days on the days that I am traveling so I can accommodate my longer runs. I hope this will become easier once I start traveling on my own, because then I can call the shots about when to eat dinner, where I stay, and what time I need to wake up in the mornings, but since work would have to come first on those trips, learning to be strategic with my running so traveling doesn’t mess up my training schedule will be key to keeping my training consistent.